Often dubbed ‘the final hint of civilization’ on the southernmost end of the world, McMurdo Station is a US-run scientific research station in Antarctica. The largest encampment of its kind is also the last accessible place on the White Continent one can reach by ship. Home to about 1,200 summer residents and 250 hardy folks who brave the winter harshness every year, McMurdo is a true ‘small city’ by all intents and purposes. It boasts a chapel, several ATMs, a golf course, three plane landing strips, a fire station, post office, and two bars. Granted, McMurdo Station is a long way to go for a drink, yet a visit is one of the highlights for many of our guests on cruises to Antarctica. Renowned for attracting an utterly diverse bunch of people, McMurdo is arguably one of the most fascinating towns you could visit. And considering getting there is an adventure in itself, a stiff drink upon arrival may be just the reward you’ll need! McMurdo Station. Photo credit: United States Antarctic Program (USAP). What is McMurdo Station all about? 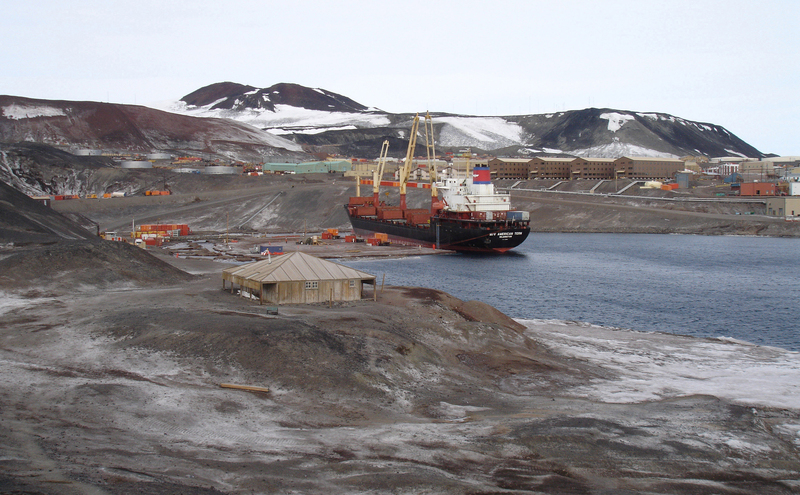 McMurdo Station is part of Operation Deep Freeze, the American Antarctic missions which began in the 1950s. Run by the United States Antarctic Program (USAP), the operation includes all the US stations on the White Continent, as well as all the restocking missions needed to keep them running. The primary objective of McMurdo is scientific research, and expert researchers work in fields of biology, chemistry, and astronomy primarily. They are geologists and glaciologists, physicists, oceanologists and almost every other type of ‘-ologists’ known to man. Everything is researched here: from climate change to Antarctic wildlife, the shifting of ice shelves and all else which may help us better understand this most enigmatic part of the world. Tens of thousands of polar diving expeditions have taken place here in the last two decades alone, and McMurdo acts as the last support base for extreme scientific research missions further afield. Whilst the great part of the research work is carried out during the more ‘bearable’ summer months’, McMurdo in winter is mostly inhabited by civilians whose sole mission is to keep the whole town – which includes a hundred or so buildings – in perfect working condition. McMurdo Station. Photo credit: U.S. Departement of Defense. Much like every other destination on the planet, McMurdo also boasts high and low seasons! In summer, when the sun never sets and the temperature can even creep above a balmy 0 degrees Celsius, the town hosts a booming population. You know, relatively speaking. In winter, however, when darkness prevails and freezing doesn’t even begin to describe the temps, only a few hundred hard-core residents remain. Contracted scientists, researchers, and civilians mostly work on a rotational basis, ranging from 1 to 3 months. The great majority who work here are actually civilians, who are in charge of keeping the whole shebang operational. Along with the researchers, this amazing bunch of adventurous cooks, builders, electrician plumbers, truck drivers, and technicians make for one amalgamous ‘family’. They hail from all over the globe, and all share a common desire to work and live in a place that’s both mesmerizing and incredibly unforgiving. Life here is both mundane and extraordinary. Residents hold art exhibitions, head to the pub to hear live music and partake in marathons. They organize trivia nights, sporting events and even held the sole protest in Antarctica against the invasion of Iraq by US troops, back in 2003. 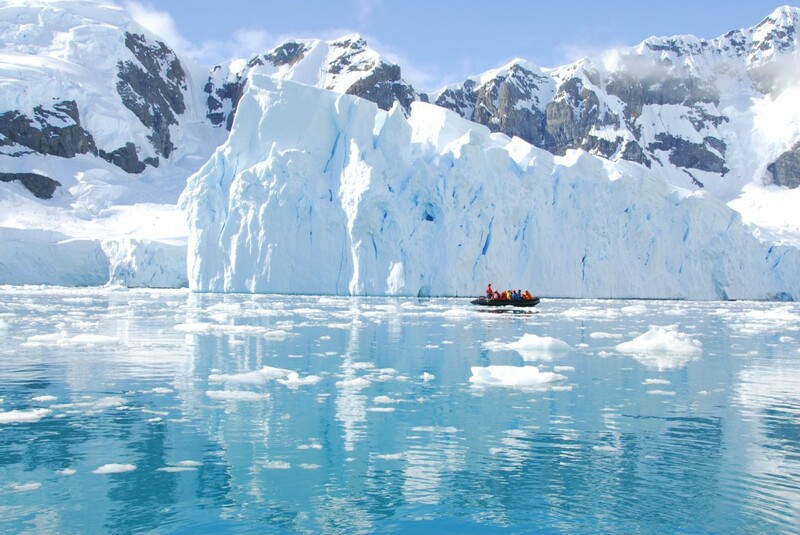 Antarctica is often described as an addictive place. Its magnetic pull, the dramatic beauty of its landscape, incredible wildlife and surreal experience means there are few who visit only once. McMurdo station is no exception. Many of the residents and scientists working and living here come back year after year. Some for decades on end. The collective time spent at McMurdo is locally referred to as ‘ice time’, something of which all are very proud to boast. Their dedication to keeping the station running smoothly, and their personal desire to live a life a little less ordinary, is the driving force behind many people’s near-obsession with McMurdo. If you’re as fascinated as we are by this amazing place and the people who inhabit it, check out Encounters at the End of the World, an interesting documentary by famed German film-maker Werner Herzog, which portrays everyday life at McMurdo and the colourful characters who call this place home. Sitting on the lounge at home, it’s easy to take things for granted. You open the tap and fresh drinking water comes out. You pop up to the corner store for supplies, and just about everything you need to survive is always at your fingertips. Not so much in Antarctica, the only continent where nothing grows naturally. Everything needed for living at McMurdo needs to be shipped in on cargo ships, with periodic restocking flights by DC10 and LC-130 Hercules picking up the slack every year. Millions of litres of fuel and tonnes upon tonnes of supplies are brought in every year to keep this mission alive and well, and an equally impressive amount of waste is brought back to the US from McMurdo. Almost one-third of the electricity used at the station is wind-produced, and more than 170,000 litres of fresh drinking water that are needed every single day, are desalinated on-site. People living at McMurdo station are, perhaps more than anybody else, acutely aware of the environmental impact each human being makes on our planet simply by ‘existing’. Minimizing their own impact in Antarctica – and rationing just about everything – is the way of life down here. Restocking of McMurdo during operation Deep Freeze in 2007. Photo credit: Wikipedia. 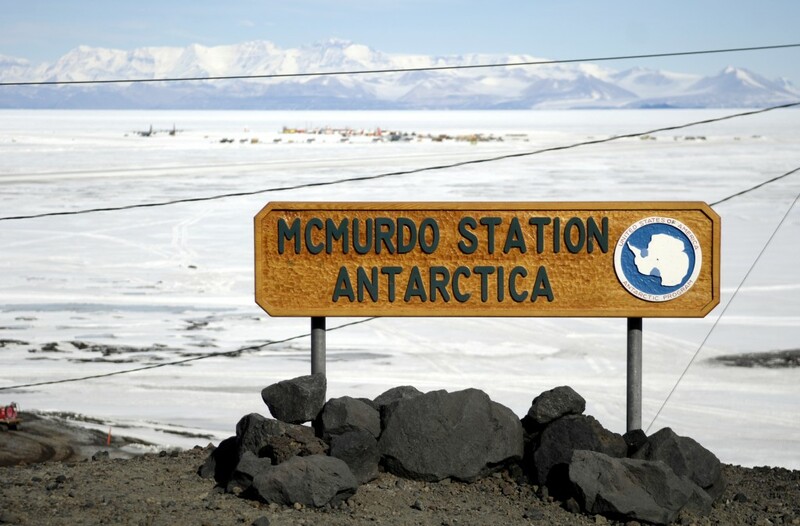 Where is McMurdo Station & can you visit? 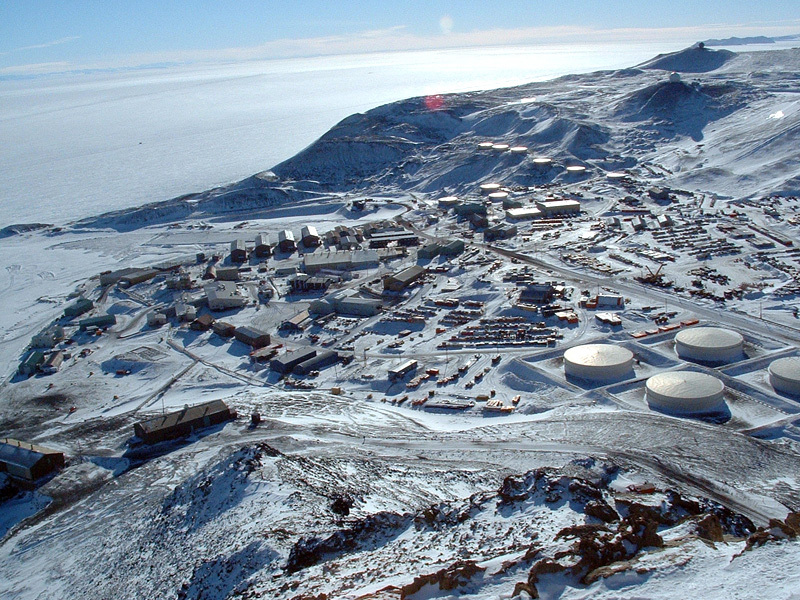 McMurdo Station shares island space with the New Zealand Antarctic Mission (a mere fraction of its size), found on the southernmost tip of Ross Island, in the heart of the spectacular Ross Sea. This is where you’ll also find Mt Erebus, the southernmost active volcano on earth. 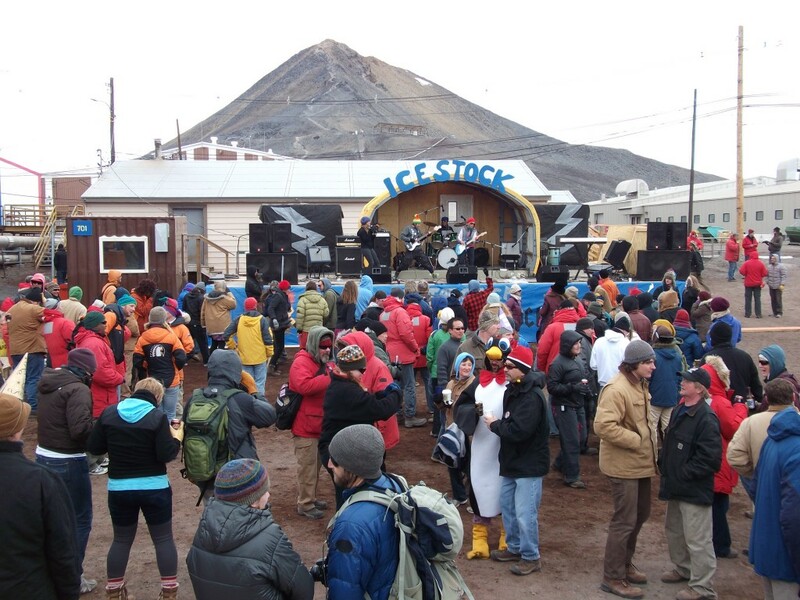 Social visits to McMurdo Station are not exactly unheard of yet permission is rarely granted. Looking for a totally out-of-the-box experience? Then head there to work! By all accounts, the pay is meagre and you get to shovel a lot of snow, but if you’re craving a change of pace, dare we say you may have just found it. It’s not surprising to learn that every year, there are infinitely more applicants than job availability, yet with a bit of perseverance and a clean bill of health there’s no reason why you shouldn’t give it a good go. Check out this general guide on jobs in Antarctica for more info, but do note that generally speaking it is infinitely easier to get a job working for the Antarctic research centre of your home country, as that’s where interviews will take place. Take a closer look at the Ice formations in Antarctica from a zodiac. Photo Credit: Shutterstock. But we have an even better option for you. Why not join us on an Antarctica expedition cruise to the spectacular Ross Sea? This is one of the least-visited and most beautiful parts of the southern continent. On a voyage aboard an expedition vessel, you’ll not only get to see an insane amount of wildlife – including penguins, sea lions, an infinite number of endemic birds, and even whales – but you’ll finally have that end-of-the-world experience to which all McMurdo Station residents are totally addicted. Awe-inspiring and unforgettable, a cruise to Antarctica is a bucket-list adventure everyone should experience at least once in life. We can also include visits to ‘easier to access’ research stations so you can get an insider’s view at the incredible work being done in our planet’s most enigmatic continent. Experience the magic of Antarctica from above as you glide over the dazzling great White Continent, the world’s last pristine wilderness and its final frontier.